Last year we started a tradition of having Sam's 5 best friends and their families over for spaghetti before high school football started. This year we weren't able to do it the night before football started because we were out of town. But we did have it the Sunday before the 2nd week of practices started, so that's something. We had all 5 families over and I made a ton of spaghetti. We don't entertain as much as I would like so I relish the opportunity to serve friends. Last year, I made the boys a poster of the lyrics from Fix My Eyes by For King & Country. 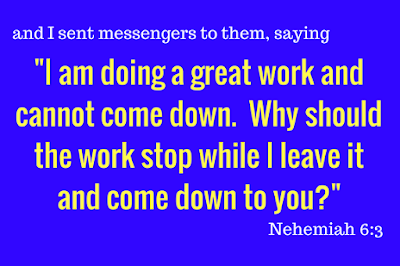 And I had decided on a verse from Nehemiah for this year. The boys discovered this year that there are people, circumstances and situations that will try to distract them from their work and goals. I wanted the boys to know that they need to stay focused. Their work can not stop while they come down to the level of those who aren't working on those same goals. I hope the verse will help remind them to keep working. 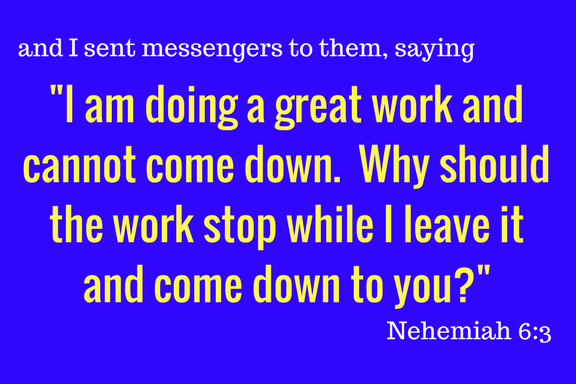 I managed to get through most of the telling of Nehemiah's story and my explanation of the verse without crying. A big improvement from last year! One of the boys asked his mom, "Do you think Mrs. Bartis will cry this year?" So they were expecting it. I love these boys so much. I'm so proud of the men they are becoming. I'm in awe of their dedication to their goals.